Pinks (Dianthus species) are a group of about 300 flowering plants. Most of them are perennial while a few are annual or biennial. Pinks are native to Europe, Asia, and in one case, North America. They grow in all these places as well as parts of Africa. Dianthus deltoides, Maiden Pinks: Easily found at most garden centers, these plants aren't fussy about their growing conditions and often thrive with little care. Dianthus plumarius, Common Pinks: With its clear, bright pink color and bright green foliage, this is what most people think of when they use the term pinks. 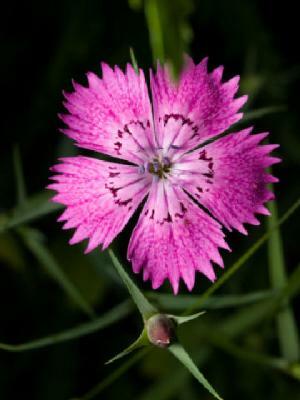 Dianthus caryophyllus, Carnation or Clove Pinks: These flowers have a spicy, strong fragrance. Dianthus species, Wildflower Pinks: These flowers are old cultivars that have been grown in England for hundreds of years. They are heirloom pinks that have naturalized in parts of England. Dianthus ripens, Arctic Pinks: This is the only variety native to North America. It grows in the Arctic areas of North America. Pinks can be grown either from seed, cuttings, or transplants. Named varieties must be cultivated by cuttings or transplants. It is easier to buy a pot of pinks to plant than to cultivate your own. Pinks are hardy from zones 3 to 9, so you should be able to find some variety to grow in your area. They grow best in full sun. Pinks like rich, well drained soil. They do not like their feet to get too dry, however. To prepare the soil for them, till to a depth of six inches. Place three inches of compost on the area to be planted and till it in to the six inches of dirt you have just loosened. This will provide for drainage as well as retain water for the roots when needed. Seeds should be planted in the prepared ground after the last frost and lightly covered with soil. Water the soil gently, being careful not to wash the seeds away. Transplanting pinks is very easy. It should be done after all danger of frost has past. Plants should be planted 10 to 12 inches apart. Varieties vary from five inches to three feet tall, so leave enough space when planning your flower bed. When you plant transplants, you should dig a hole twice as deep as the pot and just as wide. Remove the pink from the pot and set it into the hole. Fill the hole with potting soil or compost and soil. Make sure you fill in the hole to the same depth the pink was in the pot. Water the pink in. Do not mulch the pinks as it leads to stem rot. Pinks need to be watered an inch a week all at once. Watering once a week will promote good root growth. Keep roots slightly dry rather than over moist. A general balanced fertilizer, such as a 10-10-10, can be applied once or twice a year, starting in the spring. Pinks bloom from spring to fall. Deadheading the blooms encourages the plant to continue blooming and contributes to a neater appearance. Every two to three years, pinks should be divided and replanted. This is an excellent way to get more pinks. Larvae of the cabbage moth feed upon pinks, but other insects tend to avoid them. One noticeable problem with pinks is their leaves turning yellow or brown. If you notice this happening on your pinks, decrease watering and be sure the crown has good air circulation.Yellowing leaves are often a sign in pinks of too much water, rather than too little. Another common problem among pinks is mildew or fungus. Typically this problem appears in August, especially in humid climates. Use a fungicide as directed to counteract this problem. Pinks have been grown for a long time. While the proper name for pinks is dianthus, they have referred to as pinks as far back as the 14th century. 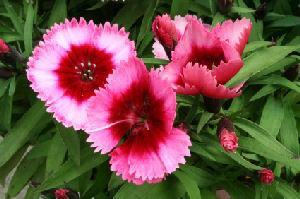 The color pink itself is named after the dianthus flower. Even the sewing tool known as pinking shears, a type of scissor that creates a wavy edge, may be named after the ruffled dianthus flower. Gardeners throughout the ages have included pinks in some form in perennial gardens and fragrance gardens. 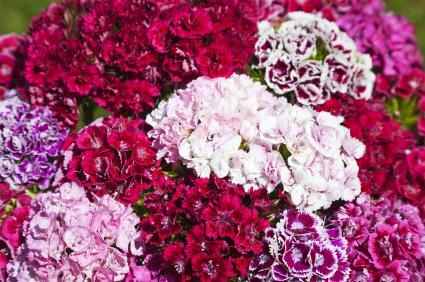 Relatives of pinks include Carnations and Sweet Williams. Pinks are a showy, easy to grow perennial plant that has so many varieties that almost anyone will find one to like. These relatively low maintenance plants will add color and flair to your flower garden year after year.